A super harness that spreads the weight across the back leaving your hands free and your neck free of pain. This is the camouflage version. With Safari, you can take your camera and have it available at all times, without feeling its weight, the camera sliding along the straps for shooting. The harness can take a camera and a pair of binoculars at once, the camera being able to move freely over the binoculars. 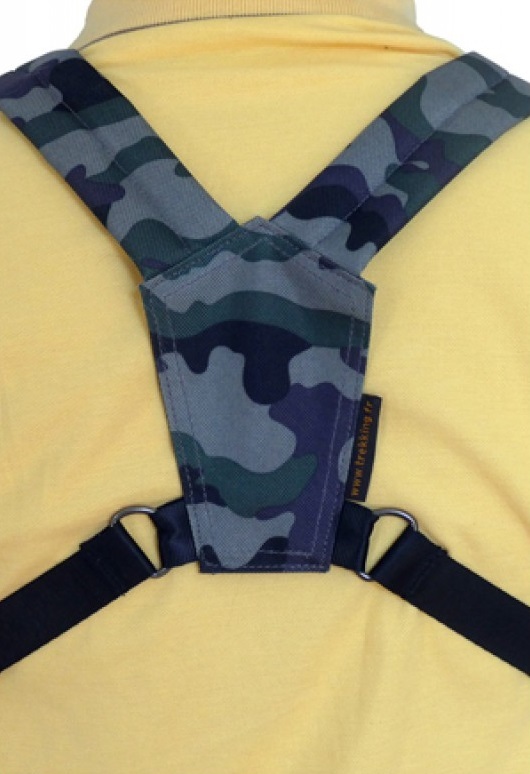 The Camera clips on to the harness with buckles that can each take up to 15kg. As the Camera (or the binoculars) are secured by a two points fixation, your peace of mind is ensured. The Safari Sport is particularly suited to women as well as smaller builds. It is designed for people measuring less than 170cm. The Safari Sport is ideal for birders who want to carry the binoculars in a secure manner on their front, in which case the bins can be fitted with the buckles. If you want extra comfort for longer wear, or if your camera is heavier choose the Classic or the Super Safari. The harness can be adapted to take two cameras by using the cross system. If you have an extensive camera collection, the camera buckles can 'ready' your cameras to be clipped onto your harness and you can also use them as short handling straps.